In preparation for Saint Philippine Duchesne's Feast Day, all our 24 Network Schools joined together to say the Bicentennial Prayer. Rose Philippine Duchesne was born August 29, 1769 in Grenoble, an ancient city, France’s beautiful archway to the Alps. One of eight children in a family of privilege, she was strong-willed, impetuous and generous. Educated by the Visitation nuns at Ste Marie d’en Haut monastery, she was drawn to their life of contemplation. She entered the congregation when she was 18, against the wishes of her family. The French Revolution soon forced the nuns to leave the monastery, and Philippine returned to her family. For eleven years, she risked her freedom and life by nursing prisoners, bringing priests to the faithful and teaching and feeding poor children. At the close of the war, she gained title to Ste Marie d’en Haut and opened a boarding school. Only a few other nuns returned, and they did not stay long. In December 1804, she met Madeleine Sophie Barat, who in 1800 had founded the Society of the Sacred Heart. Philippine immediately turned over Ste Marie d’en Haut and entered the Society. A deep friendship formed between these two remarkable women of such different temperaments. For twelve years, the patient wisdom of Sophie molded the ardent, steadfast Philippine into a religious called to glorify the Heart of Jesus. Philippine, whose greatest joy was to spend whole nights in prayer, soon felt a call to serve as a missionary. 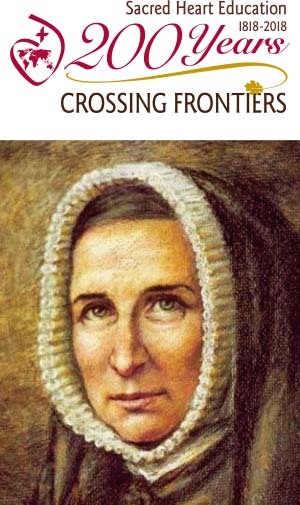 Many times, Philippine shared with Sophie her dream of bringing the Gospel to the native peoples in America, but her skills were needed at home, first in the school at Ste Marie, later as the Society’s secretary general. Philippine saw a chance to turn her missionary dreams to reality when Bishop William Du Bourg visited the Society motherhouse in Paris. He had come from the United States to recruit nuns to establish schools for the Indians and French children in his diocese of Louisiana. On May 16, 1817, Philippine begged Sophie Barat on her knees for permission to travel to the mission; at last Sophie gave her consent. Philippine sailed with four other religious the following year, providentially arriving in New Orleans on the Feast of the Sacred Heart, May 29, 1818. She later sailed up the Mississippi River to St. Louis, Missouri, a trip of forty days, arriving on August 22, 1818. On September 14, 1818, Philippine opened a school in a log cabin, not in St. Louis, as expected, but in nearby St. Charles, Missouri. It was the first free school west of the Mississippi. A few weeks later, the Academy of the Sacred Heart was opened with three students. The frontier conditions were a challenge, but even more so was the limited population. Philippine was forced to close this school after one year and open a new school in the nearby town of Florissant. Despite being challenged by the English language, Philippine served as both superior of her religious community and head of the school. She reserved for herself the most menial of chores: tending livestock, chopping wood, gardening, mending shoes and clothing, nursing the sick and making soap and candles. In Florissant, she often slept in a small closet under the stairs so she could slip in without disturbing others after her all-night prayers in the chapel nearby. (This room can still be seen at the Old St. Ferdinand Shrine in Florissant, Missouri.) She survived pioneer conditions, a bout with yellow fever and persistent feelings of failure. The Society soon attracted new vocations and opened a novitiate. Before long, Philippine was responsible for five convents: St. Charles (which reopened in 1828), St. Louis and Florissant in Missouri, and Grand Coteau and St. Michaels in Louisiana. While Philippine adapted to the American culture, she preserved the ways of the Society as much as possible. With the Plan of Studies in place, the Religious of the Sacred Heart offered their students a well-rounded curriculum, combining spiritual and intellectual training. Philippine’s schools were the first in St. Louis to educate students of color. She also opened the first orphanage in St. Louis. Finally, in 1841, Philippine’s desire to serve among the native people came to fruition. At the specific request of Fr. Peter Verhaegen, the Jesuit in charge of the mission, she went with three other Religious of the Sacred Heart to Sugar Creek, Kansas, to establish a school for Potawatomi girls. At 72, she was too frail to be of much help with the physical work, and she could not learn the Potawatomi language. She spent much of her time in prayer, gaining the name “Woman Who Prays Always.” After just one year, she was called back to St. Charles because of her health. Although she was in Sugar Creek just a short time, she made a deep impression on the Potawatomi. 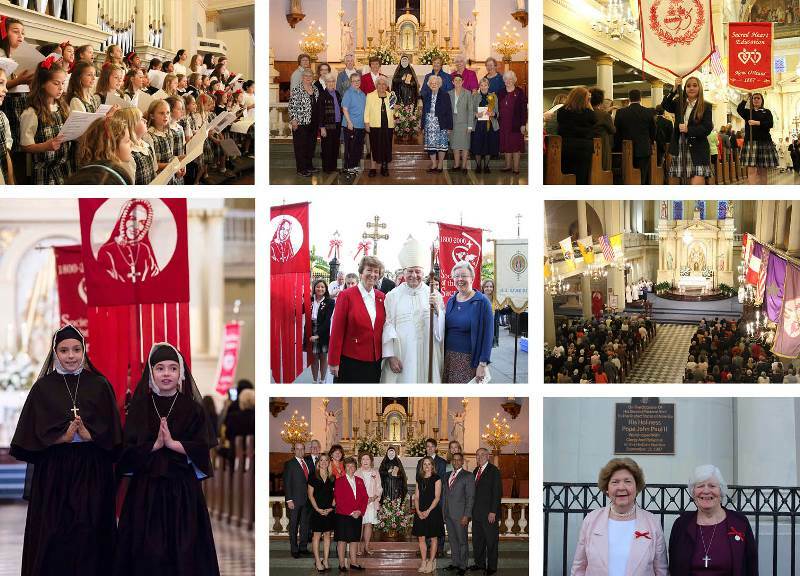 The Academy of the Sacred Heart, which is part of more than 150 Network of Sacred Heart Schools across the globe, celebrated a milestone on November 18—the 200th anniversary of St. Rose Philippine Duchesne's arrival in New Orleans from France.